Naval Weapons Station Earle (NWS Earle) is located in two sections within the state of New Jersey. The waterfront section is in Leonardo on the Sandy Hook Bay and serves as a location for ammunition to be loaded and unloaded. The main side section is in Colts Neck and houses the majority of Earle's departments and facilities. Both sections are connected by a private, federally owned road. Colts Neck of NWS Earle sits in the heart of New Jersey’s horse farming region and is only 20 minutes away from the famed Jersey Shore. Sandy Hook Bay overlooks the Atlantic Ocean and the New York skyline. 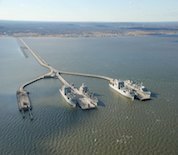 This Naval Weapons Station Earle directory features the critical info you’ll need to navigate through the many facilities and recreational opportunities available on base.